You don’t know what you don’t know, but there is a way to find out! Discover how to find and close skills gaps in your learning and development programs and watch your training effectiveness improve along with learner performance to the benefit of your entire organization. 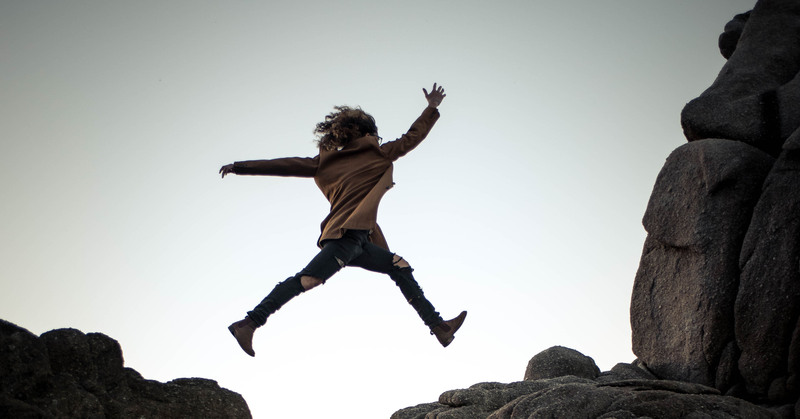 What is a Skills Gap... And How Do I Analyze It? 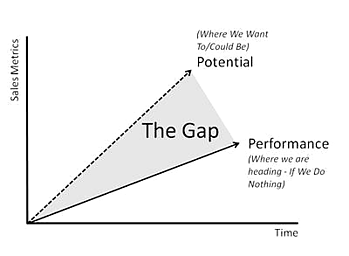 The simplest way to think about a skills gap is to consider the difference between performance and potential within your organization. A gap analysis brings this inequity to the foreground. It’s an effective way of asking questions about productivity within your team - what does your workforce currently offer, how well do they meet targets, and what would they need to perform optimally? A skills gap can appear in many forms, depending upon the type of organization under analysis. It might be a question of training - employees requiring more technical expertise, or a better understanding of company philosophy. At a larger level, a skills gap may signify the need to acquire more specialized employees. On the other hand, a skills gap might stem from infrastructural inadequacies, or a need to develop better communication practices. A skills gap analysis measures an organization's ability to meet its objectives, so a quantitative measure of performance is required. For the majority of businesses a financial measure, such as a profit margin, is the best descriptor of performance. But there may be other more relevant measures depending on the type of organization. Turnaround time, for example, might be a good indicator of service-based performance. Discrepancies between expected and actual performance can then be used to pinpoint areas where training or innovation would help. 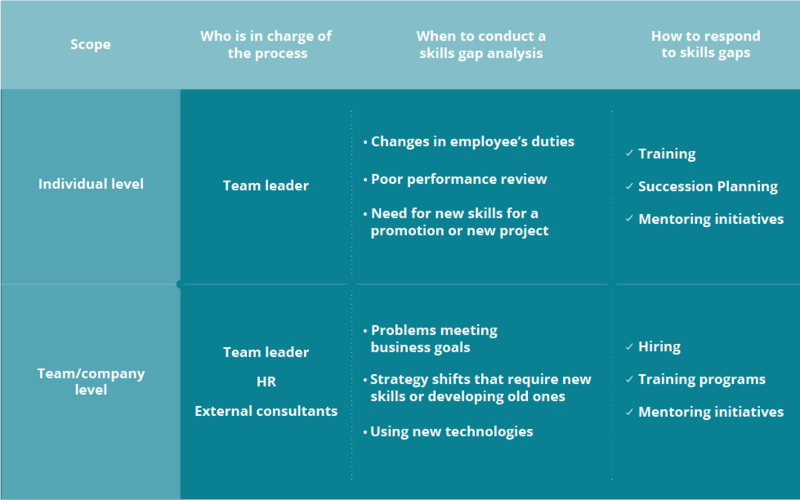 Because of their comprehensive nature, skills gap analyses are useful for considering the relationship between a team and their objectives. Conducting regular analysis reveals patterns in attainment and underperformance within an organization, and gives an effective indication of the health and versatility of company processes. In turn, this provides direction for training programs and hiring practices. What’s the Best Way of Identifying Skills Gaps? Once a skills gap is identified, it becomes more straightforward to create actionable steps to bring performance in line with potential. But what are the most reliable methods of recognizing gaps in the first place? The key to accurately measuring performance and identifying skill gaps is asking specific, astute questions of your organization. Think about the fundamental what and why questions, which help identify the reasons behind your data. Has your organization focused on hiring a specific type of skill, thereby unknowingly neglecting other important skill sets? Take the difference between hard and soft skills, for example. Hard skills are specific, teachable abilities that can be defined and measured. This is regardless of skill complexity, so covers anything from typing to hedge fund management. Soft skills, on the other hand, are those which aid general performance within an organization. Examples include managing your time, creative thinking and the ability to lead. Fast-growing companies often fall into the trap of acquiring many employees with excellent hard skills in response to specific problems and requirements. This can cause an overall soft skill gap within their business. How Do Skills Gap Analyses Benefit My Employees? An important detail of skills gap analyses is that they can be performed on two concurrent levels: individual and company-wide. This means that, while aiding the general performance of an organization, gap analysis is also a useful tool for the personal development of individual employees. You can even initiate two gap analyses for an individual - one self-evaluated by the employee, the other by the employee’s line manager or team leader. The results are then used as the basis for discussion within a performance review. Knowing how employees and managers evaluate differences between performance and future expectations can provide insight into workplace relationships, leading to better communication strategy. What If I’m Already Aware of My Company’s Skills Gaps? Even if you’ve already formed clear ideas about the talent required for your company’s growth, a skills gap analysis can be a valuable tool. Knowing exactly where to channel time and resources - and having quantitative evidence to back up that knowledge - is an excellent way to increase efficiency and focus within your organization. It also lends to a calm and more organized atmosphere, where everybody is on the same page when it comes to the direction your company is heading. Want to implement skills gap analyses to benefit the eLearning programs in your organization? Why not get in touch, to see how we can help you meet your performance targets. Disclaimer: This article was contributed by guest blogger Joe Hitchcock. Joe is a content writer from Vancouver BC, interested in culture, education and fiction. The views and opinions expressed belong to the guest blogger alone, and do not necessarily reflect the official policies or opinions of Lambda Solutions.